A thinker who has questioned the very idea of progress, development and even modernity, anticipating the criticism of the total institutions that, only a few decades later, was launched by Foucault and, in Italy, by Basaglia. IVAN ILLICH, (1926-2002), Austrian by birth but American for acquisition, was a writer, educator, philosopher, linguist, theologian and historian of institutions. One of the most radical intellectuals of the second half of the twentieth century, he lived most of his life in Mexico, where he directed the Centro Intercultural de Documentación in Cuernavaca. 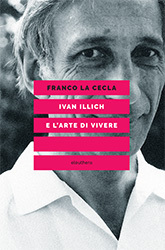 FRANCO LA CECLA, anthropologist and urban planner, has taught Cultural Anthropology in Berkeley, Paris, Venice, Bologna, and Milan. With elèuthera has already published: The Ape car. The only pop way to traffic (2009), Savoir faire. Talking bodies (2009), Virility/Blunt Ways (2010), Objects' emotional lives (2013), A Moral for Everyday Life (2012), Breake up (2014), Local Mind (2015) A Eulogy of the West (2016).